Our ceramic dish gardens are filled with and mix of green and verigated leaf living plants and are perfect for almost any occasion. 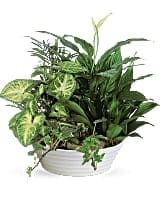 The 8" diameter planter is in an attractive neutral colored ceramic container, typically white, tan or green colored. This item is available in 4 sizes, 7", 8"' 10" and 12" diameter containers. Call to order other sizes.